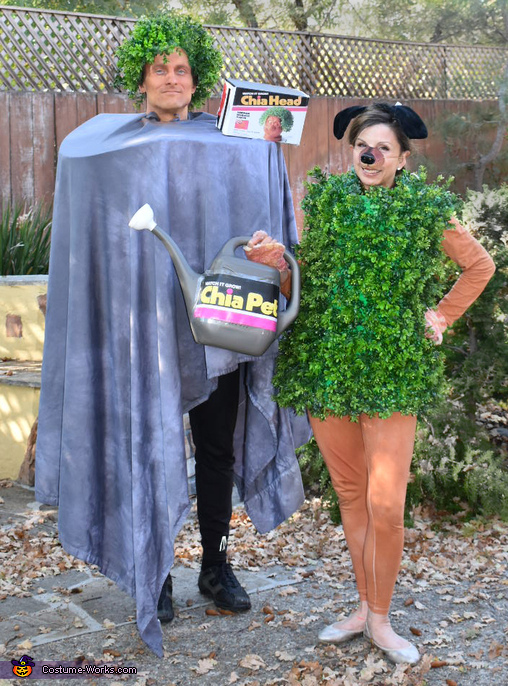 I wanted to create a couple’s costume for my husband Philip and myself that was different and funny. Plus...who doesn't love 80's nostalgia. I started off by making the chia head. I spray painted a bald cap green with paint I already had. I bought a bald cap for $5 and two artificial vines from the craft store 2x $8 with my coupon. The green on the vines snapped on to the branch. I cut up the vine to half inch pieces and took out the greenery from the stems. I then inserted the branch part on the underneath side of the cap. Finally, I snapped the green clovers back into the branch. The result was a bushy head of Chia hair. We crated the Chia head box with print outs over cardboard. The table was also created with cardboard and we added the sheet that we already had. We mixed yellow red and brown face paint to complete the terra cotta look. Total cost was $21. For the Chia pet I bought 9 artificial 10” artificial boxwood mats together ($5 x 9 =$45). I took the leaves out of the grids and strung together two rows of grids together for a total of 8. I then cut the last one up and used it as the straps. Once I had a form, I put an oversized T-shirt over it and poked holes in the shirt. I then replaced each clover element by snapping it back into the grid through the shirt. The result was a clover covered shirt. I already had white shirt and leggings for underneath. I bought some dye ($2.50) to create the terra cotta underneath. I topped it off with some ears for $5 and a nose for $5. The total cost of this costume was $57.50.